we’re back here with some fun stuff for your eyes, ears, nose and mouth….you’ll have to imagine the esoteric smells of the different objects…from mildew to fresh cotton :). Yikes we’ve been doing mail-outs, and released record like these, now since 1989….that’s 30 zonked-out years. Far-out! Don’t miss the legendary Baby Grandmothers live at the Dödskallen festival at Visby (on the island Gotland) on Friday March 29. Subliminal Sounds will be there too with some nice records and stuff up for grabs. See you there! And here’s a pile of subversive mind-expanding goodies to check out behind the barn. Some great cool records threads and magazines. The equinox just passed so have a very merry spring! Now here’s a nice little pile of hand-picked out-of-this-world music and literature. Some rare OGs and some decently priced reissues. All up for grabs. Please note that these titles are only listed here, not in our regular web-shop. Records are graded disc/sleeve. 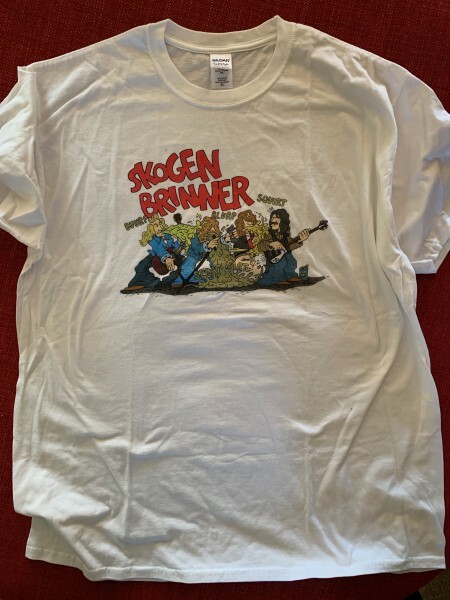 Prices in SEK (Swedish Krona) Just send us an email to reserve. Check xe.com for approximate exchange rates. Exotica masterpiece from 1957 with black labels with the rainbow design. Cover has seam splits, some general wear, slight ring wear and slight writing on the back. But all in all very nice and presentable. The scan here is this actual copy. The vinyl is very nice. Original 1stpressing of this nice Afro Cuban style album that also including a jaw dropper funky psych killer with perfect beat, flute, acid dripping fuzz and wah guitars and superb deep psych organ leads. So good. Cover still in shrink like new but has a slight bend on the lower right corner and some war on then opening. The disc is perfect M-. This 2LP compilation is just fantastic. Gatefold sleeve with in-depth liner notes and photographs of the original releases with some mighty stunning sleeves inside. Superb wild Latin stuff. Killer comp of wild drunk US 1940s-50s electric guitar rhythm and blues culled from the original rare 78’s records. 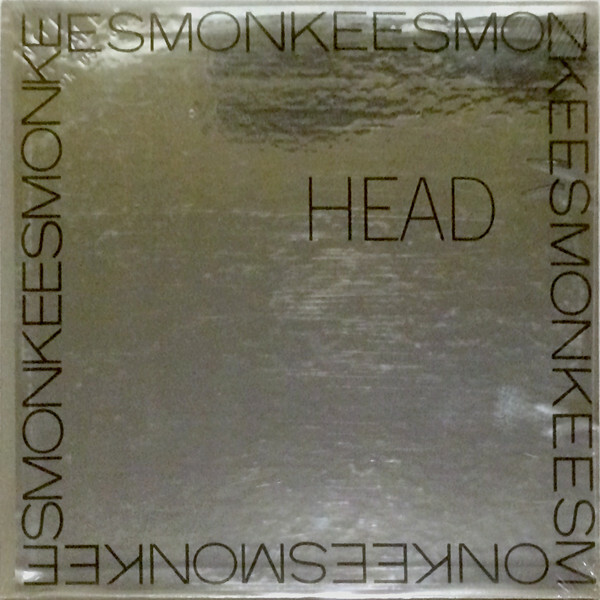 The complete original format of this now legendary modern psych classic celebrating it’s 15th year anniversary this year! 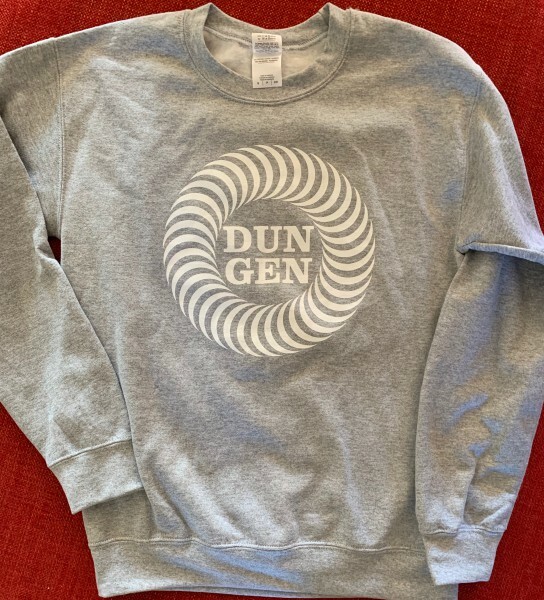 Nice thick classic grey sweatshirt. Limited edition. Size small only. Long out of print exact reiusse in thick cardboard sleeve of this fantastic and rare 1959 space age rock n roll album. Uses early voltage-controlled analog synth and a theremin . Way out! Huge fave! HiLife the magazine of leisure highs was a short lived High Times “type” magazine. 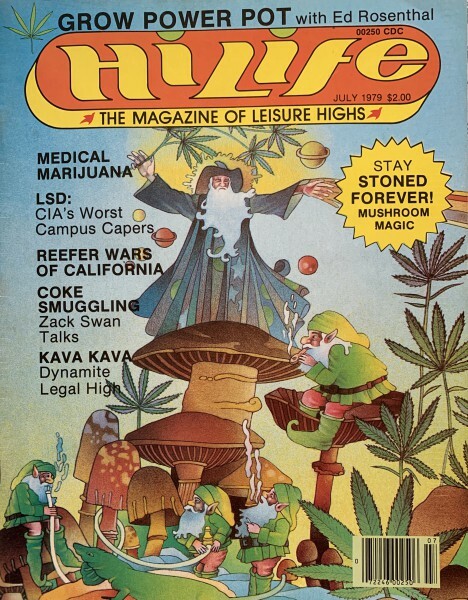 This rare and sought after copy contains 96 pages of unique articles, including a highly acclaimed and never reproduced pice on hallucinogenic shrooms, market analysis on drug trade and smuggling, as well as amazing period type adverts for stuff like pot pipe frisbees and the likes. Amazing! 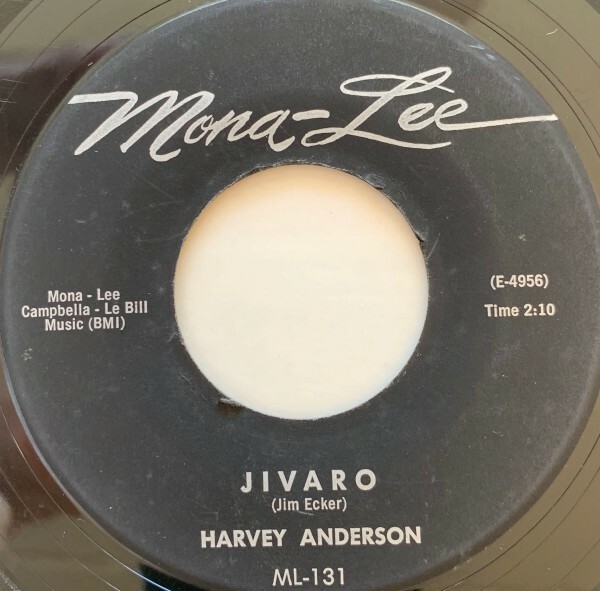 Original 1959 promo release. The unique and spellbinding vocal version of the ultimate exotica classic by this stellar American child actress (Little Rascals etc). Big band backing and sound effects. Incredible exotica! Strong Ex condition. Must have companion to the Back From The Grave comps, mind blowing US 60s garage rock comp by Tim Warren of the most elusive and great rare 60s label. 2LPs, gatefold sleeve, massive liners and photos. All tracks taken from the master tapes. 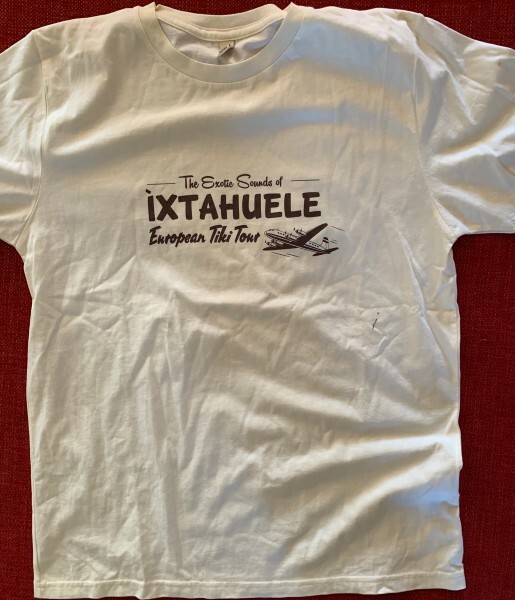 The exotic sounds of Ìxtahuele Europeran Tiki Tour t-shirt. Small limited edition print. Size S and M available. They are pretty large in the sizing. 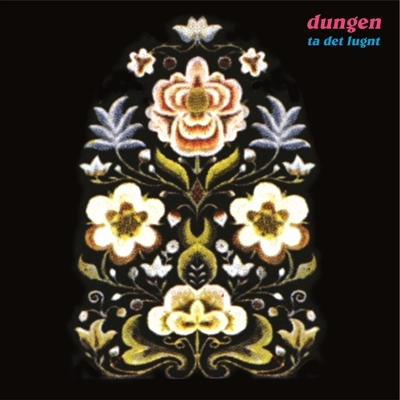 Amazing femme vocal surf rock. Probably the pinnacle for the whole genre. The wild surf lead guitar of the Smashmen really delivers with full tilt rocking reverb/echo drenched slippery wet surf licks. Even goes way deep in the ears for psych heads. One of those off the map masterpieces Paul Major hipped me to back in the day. Deluxe fold-out cover too. 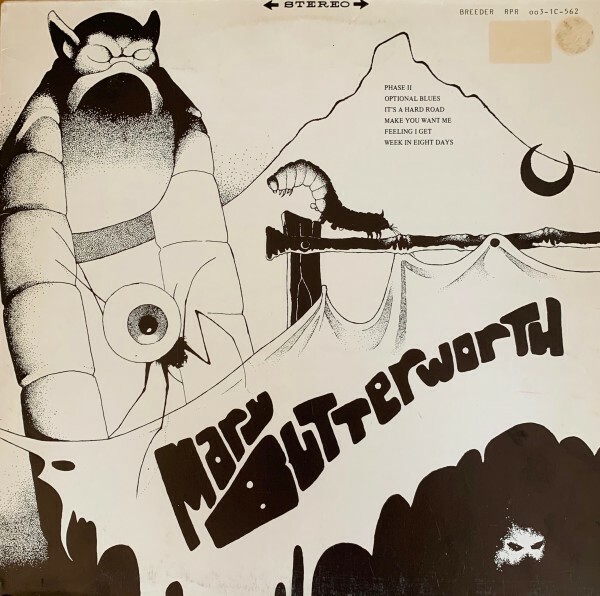 Long out of print (actually reissued like 30 years ago now) reissue of killer obscure US 1969 psych mega rarity private press. The reason to get this one is that later reissues, on CD, don’t feature the original album but a substandard re-mix and this is the only existing vinyl reissue. This reissue features the true original album and sounds great. The cover is one of the best for a US private press too. Exact long out of print reissue (from 1985) of this exploitations TV band true psychedelic LSD 1968 masterpiece. This reissue features the full 4:00 single version of the amazing psychedelic ”Porpoise Song”. Also has a real silver foil on thick cardboard sleeve like the original. Ultra Rare Acid Punk Fuzz Monsters From The 1960s! 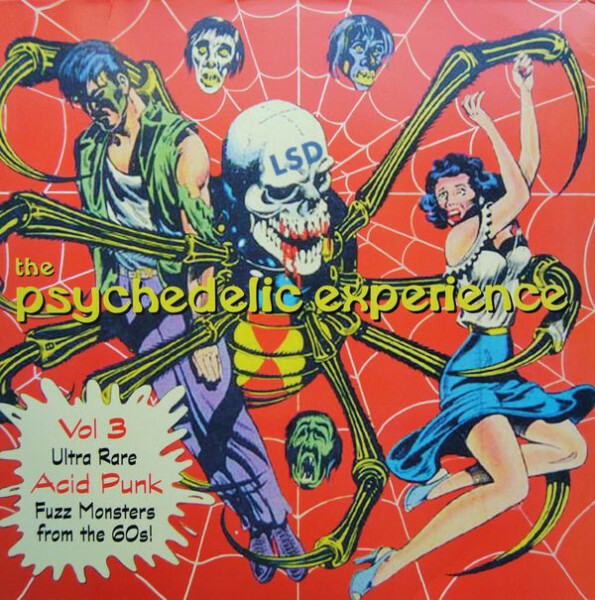 Long op legendary limited edition comp filled with uber rare US 60s garage psych 45s killers. 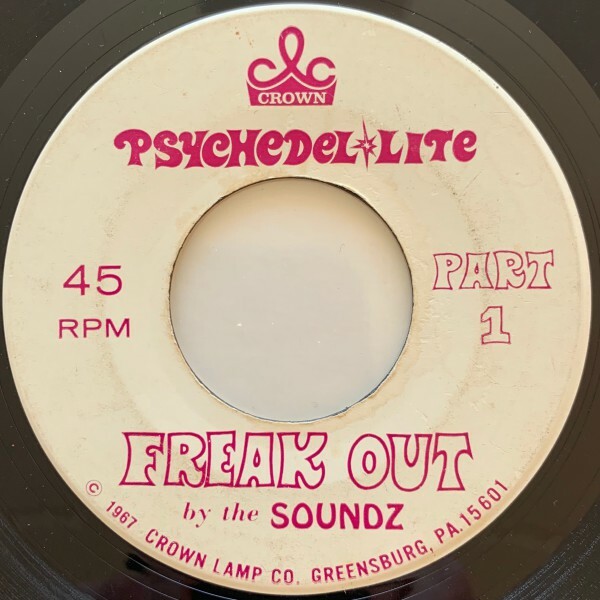 Fantastic psych pop unknown that goes deeper in the lysergic department than you would first expect. Total LSD winner for cheap. Great and cool LP Tiki exotica floor show at Don The Beachcomber. Lotsa wild shark skin drum rhythms and other wild stuff. Probably the best Tiki bar restaurant floor show albume ever. 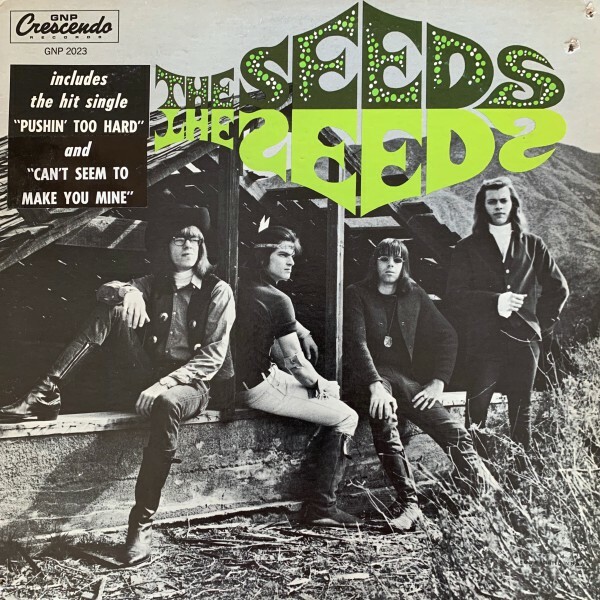 Original 1st pressing US mono release. Blows away and stereo pressings…this is how this killer US 1966 garage psych masterpiece album should be heard. Total mind melt musically. Has “Includes the hit single Pushin’ Too Hard” sticker on cover. Labels are red with curved white “GNP Crescendo” at top The records has marks, some feelable, but plays amazingly quiet and loud with just occasional clicks and crackle. Like most of the marks weren’t even there. I’d say this is a keeper copy and no need to upgrade ever really. The sleeve has two small cut out holes on the upper right corner no problem.. 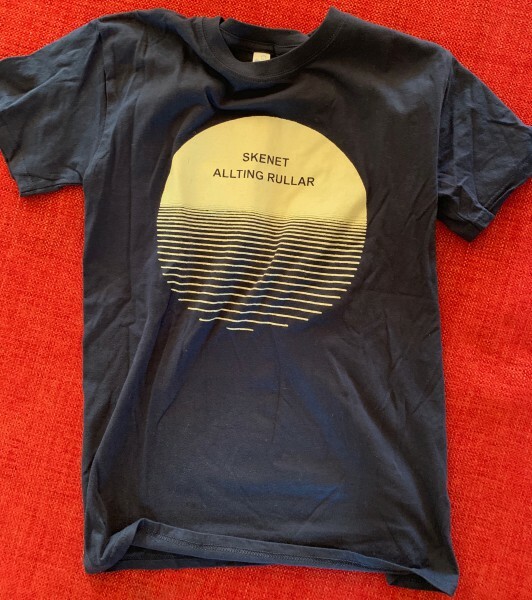 Size small only limited edition tour t-shirt print. Size XL only limited edition print. Four minutes of the outer most surf psychedelia, absolutely as good as it gets. Part 2 is really the same without the massive tripping echo. Condition of this rare 1967 45 is G+ with shiny fine vinyl but scratches are heard, especially during the quiet beginning. Very nice condition original 1970 US pressing of this highly acclaimed (but previously almost unknown) psych LP. The story about this guy who disappeared with his car in the desert never to be found again is like out of the Twilight Zone. What an incredible recording he left as his legacy. Tracks like ”Higways” ”UFO” and ”Rosey” are total mindblowers. The gatefold jacket looks very fine with only some ring wear and whitening along the seams but no splits. Both the Surfmen’s exotica albums are huge faves here. Deep exotica numbers with sound effects and some hookey swirling hulas. Cover still in shrink. The ultimate junk shop glam hard rock band ever. Misunderstood back in the day but nowadays they finally get’s acknowledged for their unique brand off ripping hard rock. The flip to “Turn It Down” contains the outrageous lyrics about out their fans “ If we don’t f**k you, someone else will” which was toned down to the slightly less offensive “go down on you” for the single release. Vintage Elevators t-shirt circa early 1990s with the awesome pyramid design. Tag says size L but it’s pretty short in length for a L. All over nice condition vintage tee.